What happen to the asset of a Muslim when he/she passed away? Is it simply distributed, smoothly, according to Faraid Law? It is in fact not that simple at all. Mr. Mohd Zulkifli bin Ismail, Deputy General Manager as-Salihin Trustee Bhd shared about the real problems faced by Muslim when it comes to estate distribution. The reality on estate is that while we are alive all the properties that we own, all the assets that we have are all absolutely in our control. We are the sole owner. We can do whatever we want with it. We can sell it if we want, we can take the money from the bank, and any time we want we can transfer the property. Why? Because we are the sole owner. We are the absolute owner of the property. The problem starts when this line comes in, the “dark line of death” Ataupun “selepas meninggal dunia”. When death occurs we will lose control on all the assets which we have bought and control because we are no more in the world. So, all our assets now will be converted or will go down to the bottom and becomes the estate of the diseased. The questions that we need to ask are: Who has the power now? Who has the authority to take the money out of the bank? Who has the authority to pay off all the loans, all the debts that you have left behind? What about the business that you have set up? Who is going to transfer the ownership of the shares and so on? These are the questions. This is where estate planning comes in. A lot of Muslims out there thought that whenever they pass away, whenever they pass on, all their assets will be transferred to all their loved ones. Why? Because all the Muslims out there think that there is such a thing as “Islamic Law of Inheritance,” or in Bahasa and Arabic what call “Faraid”. So, because of the existence of Faraid, all the Muslims out there thought that upon death, all their properties will go to their loved ones. Unfortunately, it is not true. Ladies and gentlemen, I will show you some of the facts proving why. Somewhere in the year 2007, a newspaper printed something about RM40 billion worth of assets being frozen. Why? Because the diseased were not able to transfer their properties – RM38 Billion in land property, RM1.5 billion under the registrar of unclaimed money, RM70 million in EPF. So, even if your EPFs have nominees, in 2007, RM70 million of EPF money got frozen. There are RM1 million worth of titles still in the name of the diseased. So, imagine that is the figure in 2007. This is the figure in 2011: from RM40 billion, it has gone up to RM52 billion. A lot of Muslims out there are still not conscious about this. In the unclaimed balance in 2007 it was only RM1.5 billion. But, in 2011 it’s already RM4 billion. Imagine, the figure is going higher and higher. Yet, Muslims out there are still not thinking about doing estate planning. What about EPF? In 2007, it’s only RM70 million. You’re going to be shocked to see the figure in 2011. It has gone up to more than RM300 million. My God! Yet, a lot of people outside there are still not thinking hard about this. These are true stories that we got from paper clippings. Imagine. 8 replies to "The Real Issues on Distributing Assets of a Deceased Muslim"
I hv intention of converting to Muslim. When I’m converted, can I share my wealth with my brother & Sister which they are not Muslim. Should I distribute my wealth prior before I convert. I had generally read the Fariad inheritance procedures, eventually my children’s will not able to inherit them. Can my X wife able to claim my wealth after I had converted. I’m a Chinese divorce, planned to convert. Here is my thoughts based on my limited knowledge especially it touches Islamic law. Q1. You can do hibah. Or do a wasiat but can only Will away 1/3, I think can be to non-muslim too. Q2. This one depends on your circumstances. If you have too much wealth and wish to distribute it, you can do it anytime. Q3. I think your children are the main beneficiaries. Or are you referring to existing children who are non-muslim? Q4. Ex-wife doesn’t have any claim since you already divided your assets when you got divorced. 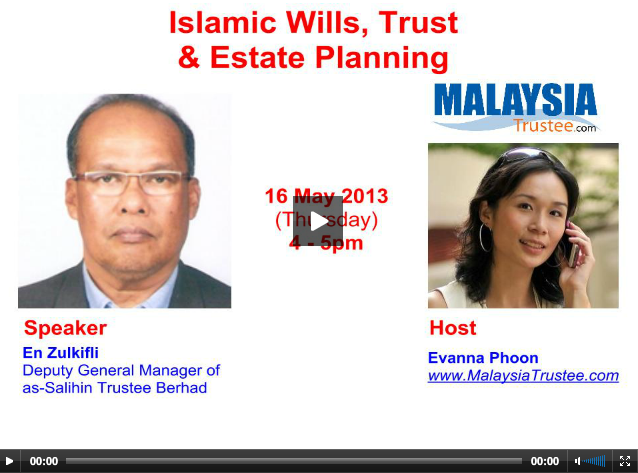 My advice: talk with estate planner who specialise in islamic estate planning. Can try as-salihin. How can I get a contact of a person with high potentials to give a talk on awareness of this problem (issue on asset distribution) from as-Salihin Trustee Bhd in my univerity, IIUM? I am conducting a program on awareness of a programm on distribution of frozen assets of a Muslim’s estate. I’m Belinda , a consultant with as-Salihin Trustee Berhad. I would like to add on a few points from KCLau. Puan Azlina, do u know who are your husband’s Faraid heirs? Knowing his Faraid heirs will give u an idea what will happen to his assets and liabilities. Is your daughter 18 years old since she is the sole beneficiary? If she is below 18 years old, kindly advise your husband to appoint a legal guardian in his will writing. As for EPF for Muslim, those nominated as beneficiaries are solely executor, hence by right the executor has to distribute the rightful portion to the Faraid heirs.